The wine known as "Flor de Pingus" which is the second label made by Dominio de Pingus in Spain's Ribera Del Duero appellation has been one of my favorite wines for the last decade or so. For a long time it flew under the radar and was relatively unknown in the world of fine wines. Now this once unknown gem that was affordable at one time has garnered enough fame around the world and i't become quite a commodity and the price has gone up quite a bit. It is still however, one of my favorite wines and is worth the price tag of above fifty dollars (and approaching $100). 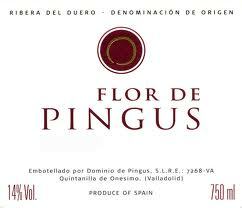 The 2010 Flor de Pingus has lovely aromas of black plum, tobacco, smoked meat, soy sauce, cassis, and vanilla. This wine is still a baby, so it's understandable that the wine is still somewhat closed down and it's really pretty obvious that this wine has multiple layers of complexity on the nose that will unfold as the wine develops in the cellar.